Welcome to Los Angeles! We will take you to the hotel via AC Coach and help you check in. You can spend the rest of the day as you want to. After having your breakfast, you will checkout of your hotel, and our representative will drop you off at the airport nodding you a safe journey ahead. The City of Angels get its name from Spanish Los Angeles. It is a city surrounded on three sides by mountains. Initially a Native American settlement, Spanish settlers claimed it for their own in the fifteenth century. After New Spain got its independence it converted into Mexican territory. The Mexican American war ended the occupation and Los Angeles and the State of California officially became American territory in the 18th century. 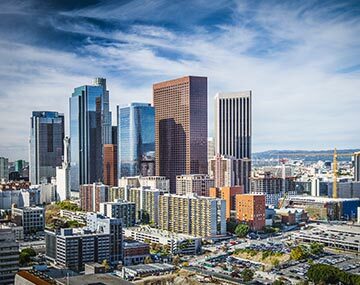 It is a widespread belief that Los Angeles or LA as it is popularly known, the Land of Hollywood. Every person here is a Screenplay writer, either aspiring, struggling or established. It is a land of movie stars and there is the Hollywood boulevard ‘The Walk of Fame’ to prove it. Museums, theatres, and art centers dot the skyline where modern and the old mix to give it a unique vibe. It is a movie enthusiasts delight with movie memorabilia available in every corner from big art cents to thrift stores. Open 365 days in a year, Los Angeles is a must visit for every tourist, but more so it is pilgrimage of sorts for a cinema buff. Charges applicable on Visa and baggage. Children of 9 years and above will be charged at adult prices. Please take care of our belongings. It is not our responsibility. The travel company can change the accommodation to an equivalent or a better one without prior notice. Entrance to any destinations not on the itinerary is not on us. So is it with events not mentioned in the itinerary. We will not refund any part of the package for services which have not been used. The right to modify or change the package without any notice rests with BookOtrip.in.